Yangon: US President Barack Obama offered Myanmar a new era in relations if it reforms and promised democracy icon Aung San Suu Kyi his eternal support in letters hand-delivered by his top diplomat Thursday. Obama also thanked Suu Kyi for her “inspiration" to people around the world in a separate letter to the fellow Nobel Peace Prize winner. 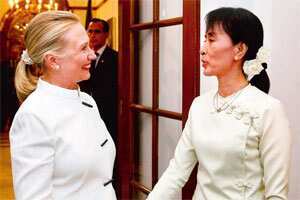 The country formerly known as Burma has surprised observers with a series of reformist moves in the past year including releasing Suu Kyi—whom Clinton met on Thursday for a private dinner in the main city Yangon—holding dialogue with the opposition and freeing some political prisoners. Obama told Thein Sein, a former general, that Washington wanted to “explore how the United States can support and advance your efforts to transition to democracy and promote protection of human rights". US officials said the message, released by Clinton’s aides, aimed to signal that Obama was ready to invest personal prestige in engaging Myanmar. The letter did not mention the words “Myanmar" or “Burma", thereby bypassing the controversy over the impoverished South-east Asian state’s true name. In her landmark talks, Clinton won promises of further reforms from Thein Sein and offered cautious incentives to encourage new action, saying more needed to be done before US sanctions could be lifted. “Any steps that the government takes will be carefully considered and...will be matched because we want to see political and economic reform take hold," she told reporters in Myanmar’s isolated showcase capital Naypyidaw.